It's been a crazy week, or three. My wife and I celebrated our 1 year anniversary over the weekend in beautiful Seattle, WA. I've started (restarted actually) my offseason job which is taking about 40 hours a week to do effectively. We've been getting things unpacked from storage boxes, breaking down the boxes, and unsuccessfully trying to find places to hide the boxes in our apartment. On top of all of that, we hosted a babyshower (pictures soon to be up at Ashley's blog buzzy craftery) for my brother and sister-in-law. In between breaths we have been driving all over Atlanta trying to see all the friends we missed during the season. So all in all it's been tiring...fun, but tiring. Let's start with Seattle. The Pacific Northwest in October might not seem like an ideal anniversary destination, but let me assure you that IT IS! Neither Ashley nor I had been to Seattle in our travels, so we decided we're young and adventurous...why not. The flight is not the best. 4 hr. 30+ min. but the cookies and ginger ale made it bearable. BTW can you buy those cookies anywhere else? so good. Anyway, we landed and checked into The Hyatt at Olive8 in downtown Seattle. 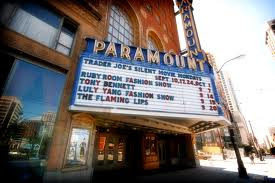 Great view of the Paramount Theatre from our window and a cozy bed to boot. of multiple food comas and walking around the whole city to make room for more delicious food. My highlight was Elliot's Oyster House where we ate complementary crab cakes and creme brulée as bookends to our delectable salmon. The best part about Seattle, though, is the people. They get my vote for nicest people in America. From the vendors at Pike Place Farmer's Market to our cab driver everyone we ran across was so inviting and friendly. If you have any urge to visit Seattle, do yourself a favor and just do it (channeling NIKE). All of this was to celebrate our first year of marriage, which is the real treat. Being married is great. I can see how people could grow to dislike it if they get easily weary of conflict or if they would rather just be single. For me though, being married to Ashley is better than any alternative reality I could want. She's loving, talented, hard when she needs to be, but sweet almost always. We teach each other continually about life from our own perspective, and because of that we are becoming more well rounded people. Also, she's my best friend and the only person I would want to spend every second around...so that helps. My offseason job is pushing me to the limit almost every day. This is not a bad thing. After a baseball season where you go along everyday doing the same thing, I relish the opportunity to come here and be thrown into the heat of issues that need solving. I spend most of my day putting out fires, but there's such a rewarding feeling when you find a way to put it out before it consumes whichever project your in charge of. I feel needed, and that's always nice. We moved to Midtown West (close to Howell Mill Rd. and Collier Rd.). Apparently there are a bunch of cool new bars, restaurants, and shops being built down there, so we are looking forward to being trendy again. Time to break out the cardigans and V necks. I think I hear my Converse calling. A possible roadblock to this is Dave Ramsey. The Financial freedom guy (nerdy bald guy with glasses) has inspired Ashley and I to start using a cash system. I see this going less than perfect, but we'll see. If we have not hung out with you and you feel spurned by us, fear not. We wanna see all of you and soon! Drop me a line (or another phrase than means contact me) and let's hang out.